Today the plane landed and 70 excited pilgrims embarked on a pilgrimage following the saints of Poland. Enjoy the video! For today’s homily by Fr. Darryl Roman, click here. Walking in the Footprints of St. Pope John Paul II's Childhood and much more! Walking Tour of Auschwitz Concentration Camp and much more! Walking through Auschwitz Concentration Camp and visiting the cell where St. Maximilian Kolbe was starved to death. It was a terrifying tour through the death camp for the group but it was good to see and understand. We are quickly losing our freedoms in America (and the West) and it is Christians being targeted for persecution and genocide in many parts of the world. 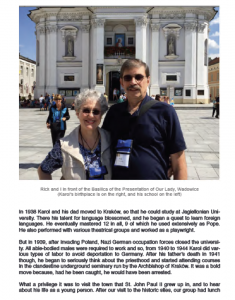 Mass at the Cathedral in Krakow (for homily click here) and more! Incredible 200 miles of tunnels under the city of Krakow. We toured the Salt Mines and had Mass 430 below the surface of the earth (homily here). 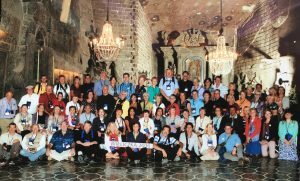 These mines contain 40 Catholic chapels throughout the passageways including a huge underground church were we took this group picture. Also enjoy our fun Farewell Dinner and Good-byes. Great second day with Teresa Tomeo, myself, Fr. Darryl Roman and 70 excited pilgrims. Visited the City of the Immaculate Virgin founded by St. Maximilian Kolbe and prayed Mass in the wooden chapel he built. Saw the museum and watch 1,000’s of Polish people celebrate multiple Masses on the Feast of the Annunciation which is a national holiday! Judy Evans and her husband Rick are regular travelers with us. They joined us again in Poland. She wrote a beautiful journal of the trip with pictures. Nicely written, easy to read, choice pictures and very insightful. Hope you enjoy it as much as we did. Click here to read the whole story. 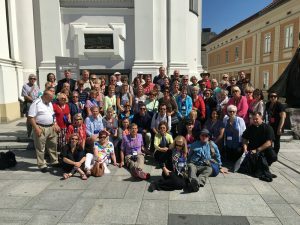 It was one thing to go to Poland to follow the footprints of Pope John Paul II, it is quite another now that he is SAINT John Paul II – especially in the Year of Mercy. It was here that the Divine Mercy Devotion originated and it was Pope John Paul II and St. Maria Faustina who brought this great gift to the world. We will follow them both and pray the Divine Mercy in the Basilica of the Divine Mercy with the Sisters of Our Lady of Mercy . One of them will give us a talk and welcome us to the convent. We will spend time praying and meditating in the basilica in front of the relics of St. Faustina.